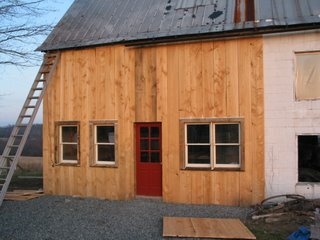 The on farm store that we are building is coming along, although not as quickly as I would like. I did manage to get the rest of the 1st floor windows and the front door installed though. I have always loved the idea of salvaged materials. Partly because I like the idea of new construction bringing along some pieces of more distant history, and partly because I am cheap (what with the Scottish heritage and all). Most of the materials for the recent store progress were salvaged. The windows are out of my parents house and the door is from my grandma-in-laws kitchen. The beams that I put in were salvaged out of my cow barn hay mow, and the center post that supports the beams is from a barn I tore down about 7 or 8 years ago after a tornado went through about 2 miles from here. 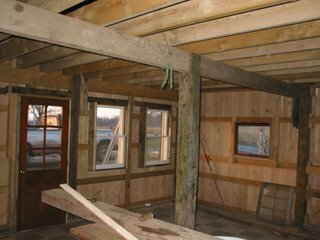 The next steps will be wiring, interior walls, and putting down the plywood on the second floor. 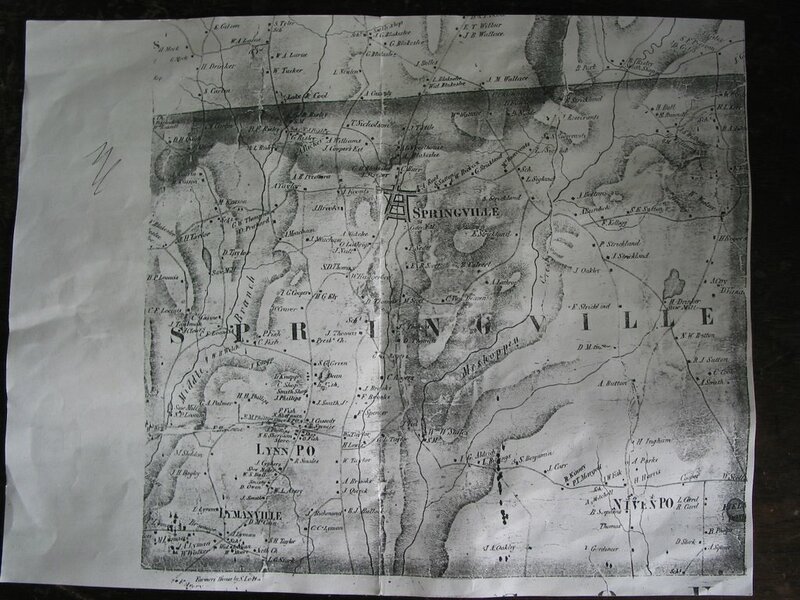 I came across this photocopy of a map of Springville Township from 1872. I am sure that this is completely uninteresting to anybody who doesn't live here, but I spent hours looking at it. The map mostly shows which family lived on each farm. Our farm, which is just to the west of the town of Springville, was owned by a J Koonts. 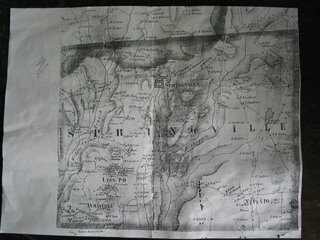 I saw an earlier map once from 1858, when it was owned by a family named Meacham. The Meachams didn't disappear off the face of the map, they just moved a few miles to the south west. A lot of the family names on these farms are still in the area, if not on the same farms. The map also shows the location of all the supporting industries at the time, like blacksmith shops, sawmills, feed mills, etc. It is impressive how quickly this information can be forgotten. I always suspected that there was another farm just to the south of ours on what used to be the Wilkes-Barre Owego turnpike. Now the turnpike is the lane from my house to barn, and after that an abandoned road through the woods. The map supports that there was. The map is full of roads that existed in the horse drawn days but have since been abandoned. 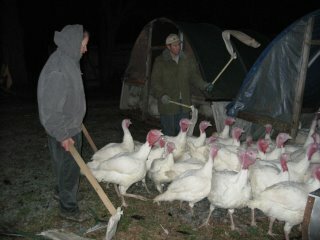 Two weeks ago today we processed all of the turkeys for Thanksgiving. We had 105 altogether. It was a much different scene this year than last. Last year it was just Adam, Seamus, and Me to do 84 birds. This year we did 21 more, but we had tile hooligans Don and Justin Lee on board as well. The extra help made the operation run like a well oiled machine. Nobody ended the day feeling like a galley slave. We also had nicer weather this year. We were done and cleaned up in time and got all the turkeys bagged up and out on a big table with the weights marked on them so that everyone had the best chance of getting a turkey close to the size they wanted. Incedentally, the one useful piece of information I got from the media sponsored bird flu panic was a tip on herding turkeys. They kept showing footage of someone in China herding turkeys with a stick with a flag tied on it, which actually works very well. Herding turkeys in the dark however is very tedious, as they won't move voluntarily if they can't see where they are going. Drake and I finished up the roof on Seamus' Mansion about two weeks ago. I have to admit that it was about the scarriest roof I had ever been on. The uphill side of the house is about 20 feet to the ground, but the downhill side is all of 30 feet. Drake and I decided it was worth borrowing a bucket truck from a guy he knows so we didn't have to be so close to the edge of the roof. The other scary part was that the old roof seemed to be made of compost held in place with moss. Seamus fell through it up to his waist at one point. Anyhow, this house was really nice at one point in history. It was built in 2 stages, the first being a pretty modest sized house with 2 rooms down and 2 up (which is the back part of the house in the picture. Later a much larger section was built on with 9 foot ceilings and a second stair case. It almost seems like it was a stagecoach stop or post office at one point. 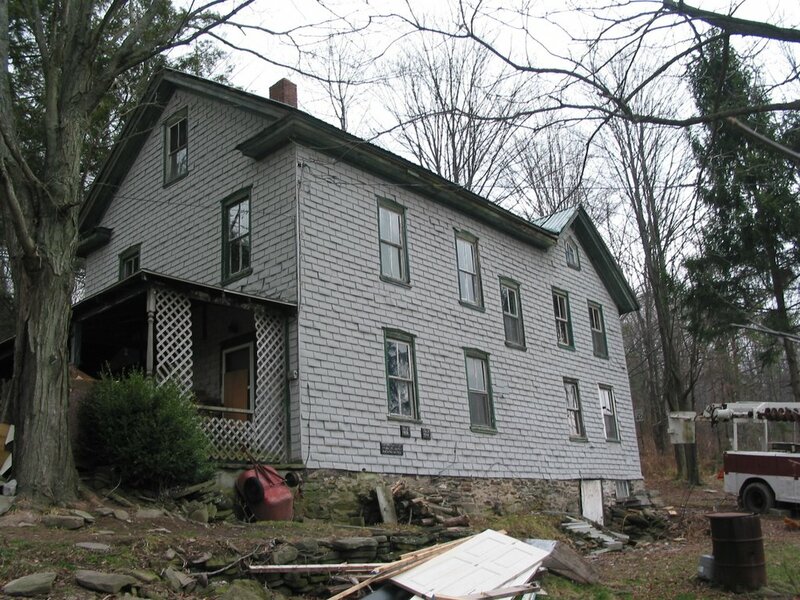 In any case, the last few decades were pretty cruel to this house. It had a steady stream of tenants who neglected and abused the place. 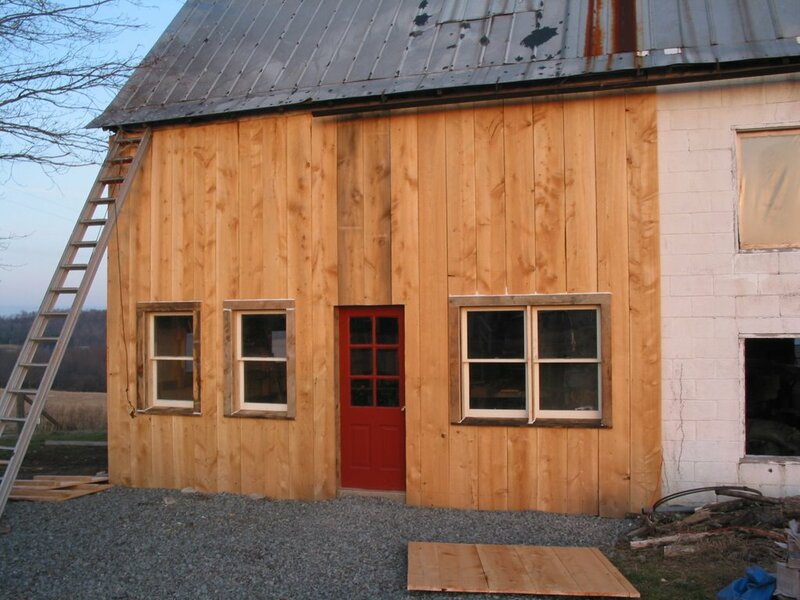 It also had a barn that burned about 10 years ago. When the offer was made for Seamus to live there the other option was to burn the house down before it fell down. It is going to be a long road back from dilapidation but it is coming along. John and Marilyn, the people who own the house (they bought it after the ruination) have invested a fair amount of money into bringing it back into a habitable state, primarily because they were interested in preserving rural Susquehanna County, and to help an aspiring agrarian get onto some land on a long term basis. 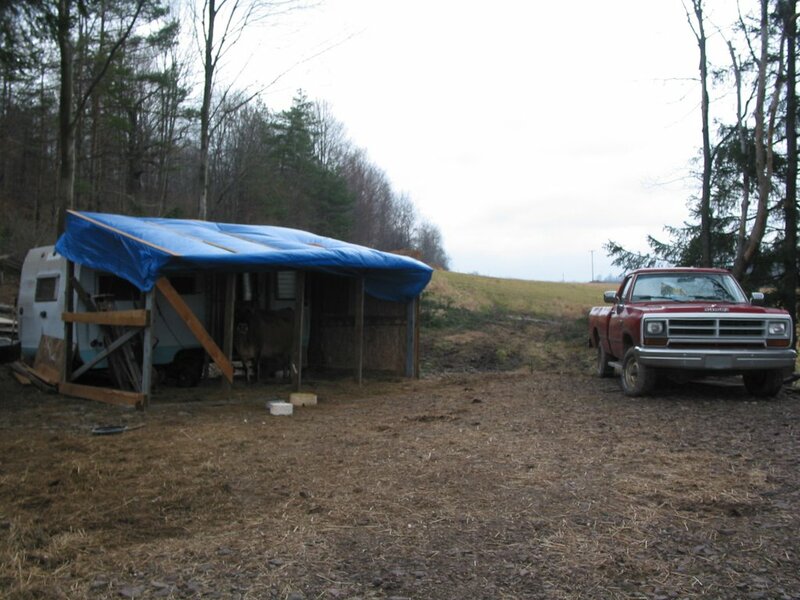 Seamus will be running a market garden on this little farm, which will provide vegetables to some local restaurants and is planning to also make vegetables available at the on farm store we are working on at Clodhopper Farm. One of the restaurants is the Summerhouse Grill which Marilyn is the owner of. It is seasonal and is centered around using locally grown meat and vegetables. Seamus calls this place Three Crows Farm.